With the cold weather drawing in I am setting about making a hot-water bottle cover for my dear mother-in-law for her birthday this week. 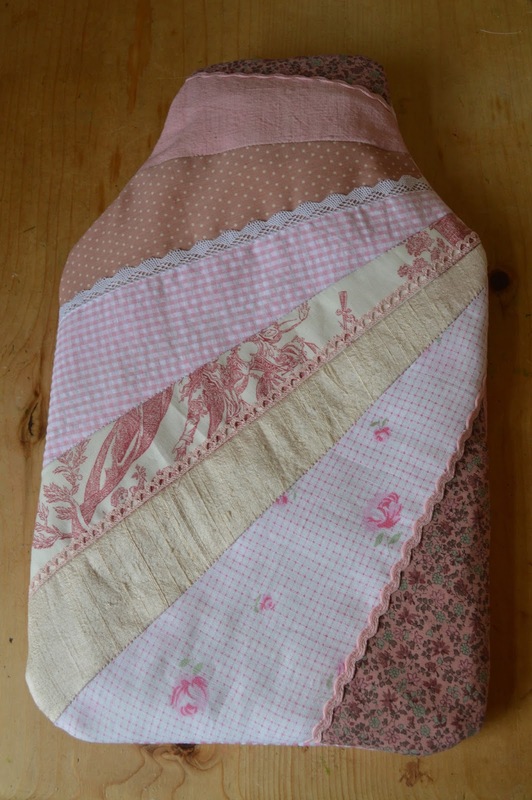 I found this lovely pack of pink vintage fabrics at our village fete that I was determined to make something beautiful out of. The trouble was that each piece of fabric came in awkward lengths and were all different types of fabric, from satin to linen. 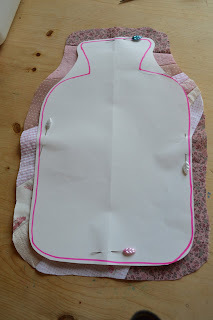 So I designed this hot-water bottle cover that showcased all the pretty fabrics and yet wasn't compromised by the differing lengths and weights of fabric. 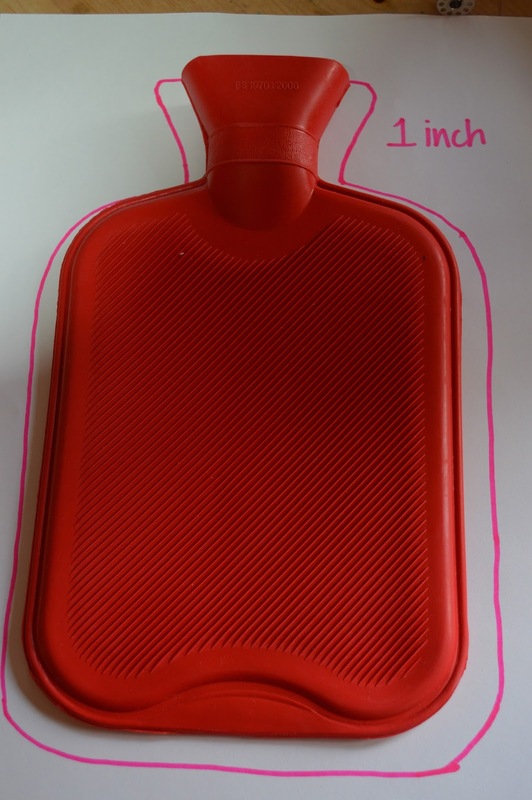 I began by drawing around my hot-water bottle leaving an inch around the outside. 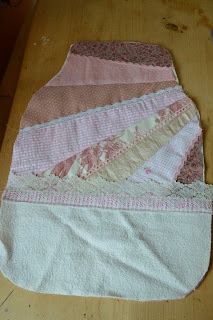 With each strip of fabric I cut it diagonally making triangle shapes. 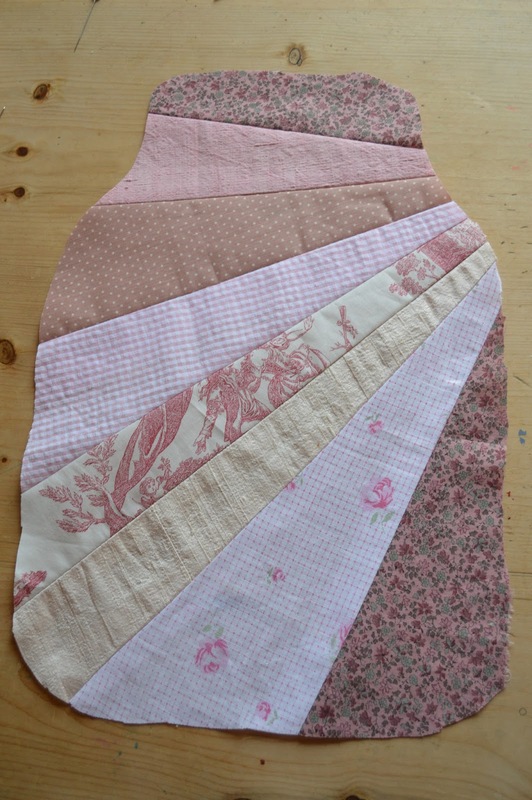 It doesn't matter if the widths of your triangles vary with this project, so it is a good opportunity to use up all your old scraps of fabric. 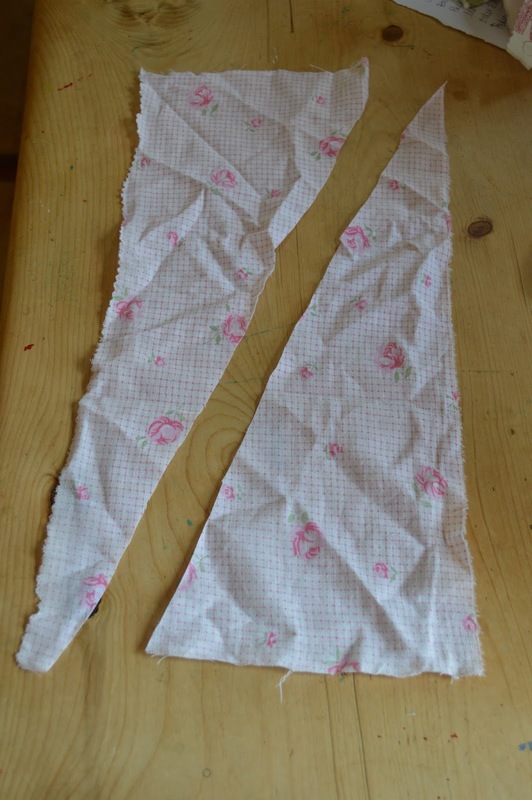 Lay two triangles (different fabrics) together with the bottom of the cones together. Fold one triangle on top of the other with the patterns (or top) of the fabrics facing each other. 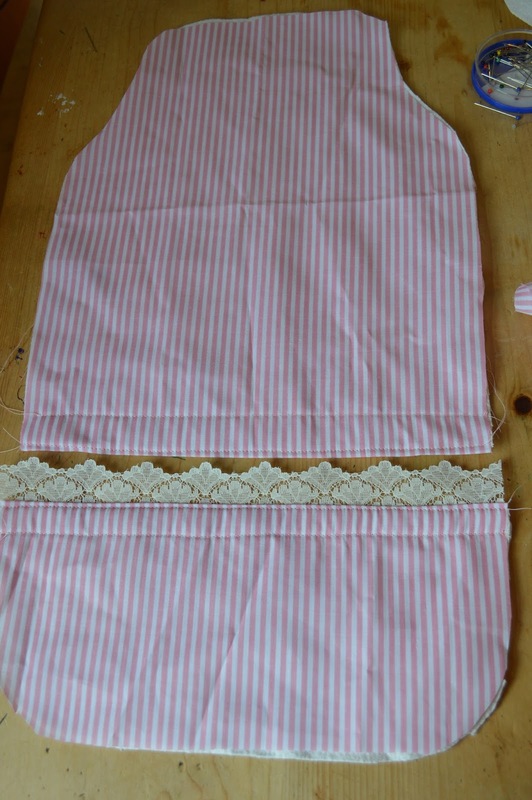 Pin into place and then sew (hand or machine) down one long length. Open it out and iron the seams wide. This is the back of the cover so now turn it over and begin again adding on the next triangle in the same way as before. Carry on until you have enough triangles added to lay your paper template on. Rotate your fabric around until you are pleased with the position of the paper. I like having the triangles facing the top right corner, but do use your eye to find what is most pleasing to you. Pin the paper over the fabric and cut out. You can see from my paper template that I have made a larger neck for the hot-water bottle. This will make it much easier to slip the bottle into the cover. It is important to cut your fabric at least 2inches wider all around your paper template. This will allow for the water bottle to be filled as well as the seams you will soon sew. I wanted to add a few pretty details so I found these lovely frills and laces at a local haberdashery shop. Gently pin them into place along a few of the lines between the fabrics. I cut a piece of heavy cotton (fleece would work equally as well) that I cut out to the same shape as the rest of my cover. Then I sewed through the lace, the cover and backing along each of the lines where the triangles are joined. This gave it a light quilting effect. You can see from this photo that the cotton doesn't even show. I have picked a light pink cotton that surprisingly doesn't even show over the lace let alone detract from it. The front is now complete! For the back you need to use the front as a template. 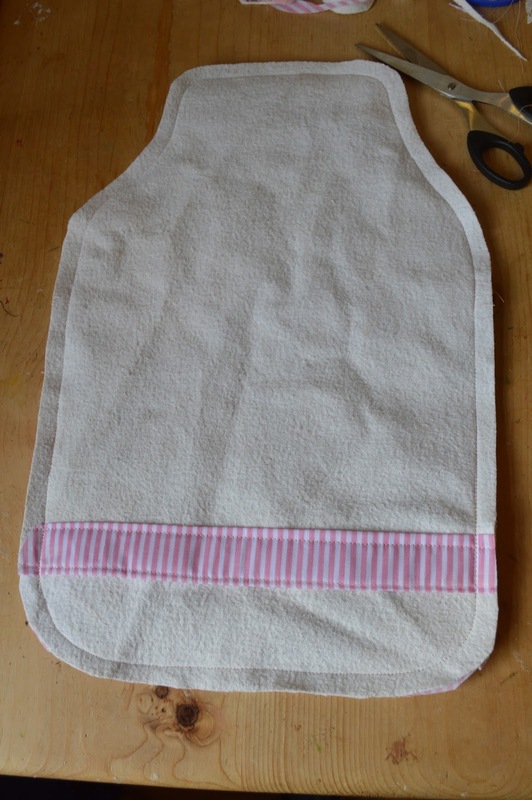 Cut your heavy cotton (or fleece) and a light cotton to the same template as the front, but cut the heavy cotton shape four inches shorter at the bottom. 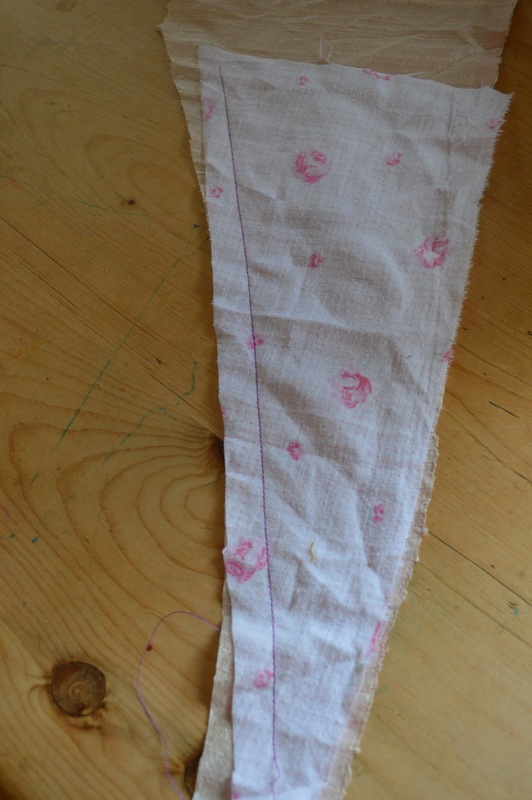 Then wrap the light fabric around the bottom of the heavy cotton and sew a seam along this bottom (pictured here on the left) of the two pieces of backing. The photo here may be confusing as the white fabric you can see is the front, and the red is the hot-water bottle. 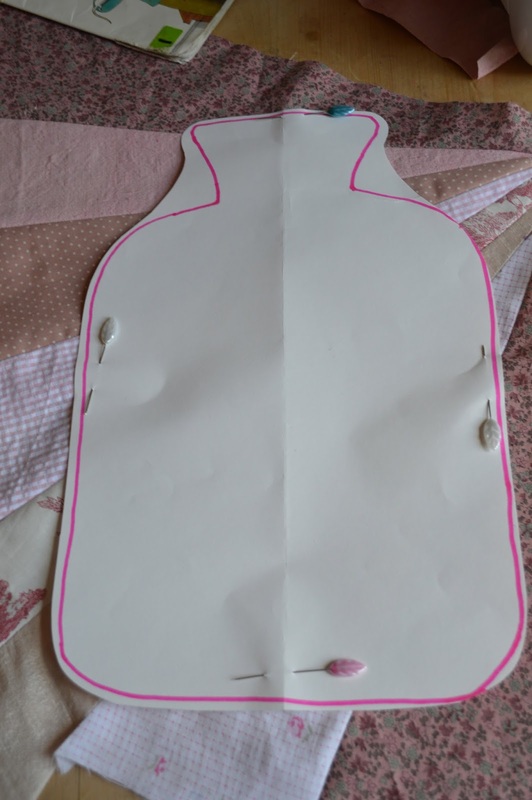 To make the bottom of the back you need to use the front section as a template again but only for the bottom third of the shape (see photo). Again cut your light fabric slightly longer and tuck it around the heave fabric and pin into place. To finish I am adding a length of lace that I will sew onto the back of the pocket as I sew this seam. I have only sewn the mid point on both of these sections. Now we are ready to essemble the three pieces. Lay the front section faced up. Now lay the bottom of the back section facing down onto the front piece. Finally add the top of the back section facing down onto the two other pieces. 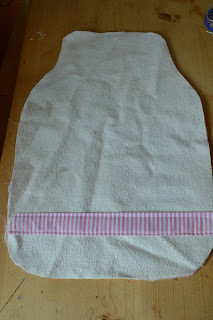 Lay your hot-water bottle on top of the fabrics and pin around the bottle leaving an inch and a half. I am not one to over pin normally, but in this incident I was keen to mark out exactly where I intended to sew. Sew around your pins going over the bottom section twice. 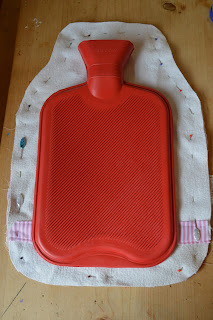 This will ensure that the opening for your hot-water bottle will not rip when stretched. 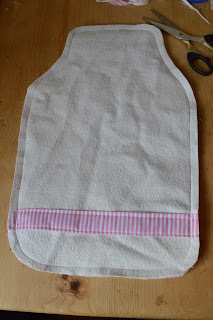 Once sewn trim around your cover leaving half an inch around the stitches. And an even more beautiful front! Happy Birthday Sue…I hope it keeps you warm at night! Our home is loud, happy and very crazy! I am married to a Baptist Minister and we have four children (born over four busy years!). I spend a lot of time trying to be creative with everyday activities and enjoying the people and things around me with much thankfulness!